Thinking to install a new HVAC system this winter? Then call our team at Texas Made Air Conditioning & Heating for a professional service. 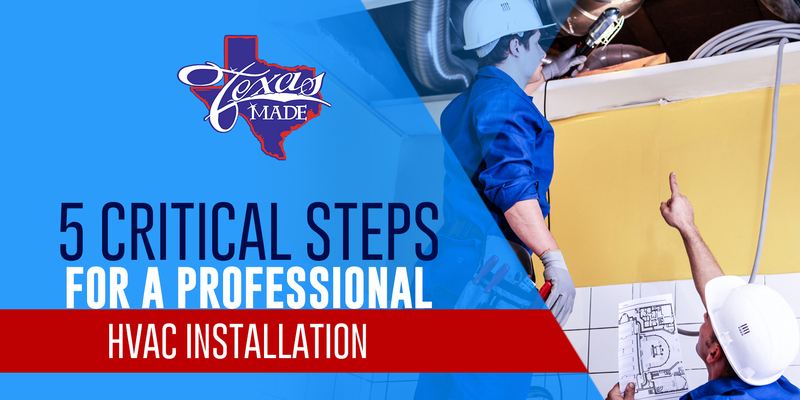 We can guarantee a reliable and fast installation process without sacrificing your budget and quality results. How we do it? We consider all factors that affect your comfort, including your space size, climate, numbers of rooms, and many more. Besides that, we also recommend the installation of automation, ventilation and humidification system, depending on your lifestyle and home’s air quality level. After evaluating your home’s comfort, we look for the right system that fits your needs. We perform a load calculation to determine the specific size of HVAC system for your space. If you recently have undergone home expansion or added another floor and need a new comfort system, you should talk to us to know the exact heating and cooling demands of your space. We suggest the best energy-efficient products for your home. We educate you about Seasonal Energy Efficient Ratio (SEER) rating and Heating Seasonal Performance Factor (HSPF) and recommend products with these standards so you can save cash on your energy bills. When you finally decide which product to pick, that is when we begin planning the installation process. We inspect and repair damages in your ductwork and refrigerant lines to make sure they work well with the newly installed system. We remove blockages that have been sitting in your ductwork for a long time to allow proper airflow and offer you better indoor air quality. Also, we examine your refrigerant lines to identify and address leakages (if there are any). We may recommend a new installation if the refrigerant lines are extremely damaged or too old. We conduct a final check to make sure that the newly installed HVAC system is working right. We check the thermostat, consistency of your indoor temperature, airflow, and other factors that relate to the performance of the system. We also conduct basic maintenance tasks as part of the performance test. Installing a new HVAC system is something you cannot just do yourself; you need us. Our team at Texas Made Air Conditioning & Heating is more than ready to offer professional and reliable heating and cooling installation and services in Granbury, TX and nearby areas. Call us for your appointment!